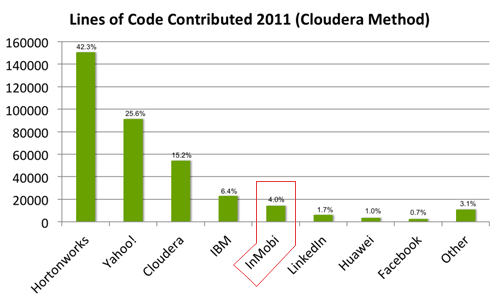 We're excited that InMobi is listed as one of the top 10 contributors to the Apache Hadoop project, along with such well known silicon valley companies like Facebook, LinkedIn and even Apple. An achievement like this is only possible because of our entire team of rock-solid datplatform engineers. 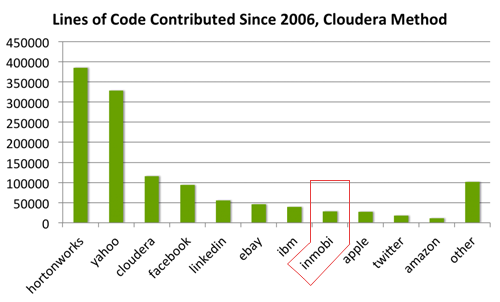 I want to thank all of you for you hard work.Open source software is the foundation of most of our engineering stacks and it plays big role in InMobi's success. It's fundamental to how we can build system that can serve 47.3 Billion impressions month! InMobi also believes in giving back to the community. Things like this are not just feel good moments for the team, but they motivate us to do even more, to go that extrmile. The most rewarding moment comes when an engineer contributes line of code, and the whole community sees it and benefits. We will continue to increase our contributions to the project and help grow the entire ecosystem.